Although The Sims 4 Seasons Expansion Pack brings tons of new customization options and traditions that you can choose, there’s still things like lacking holiday icons and no traditions for cats and dogs. Luckily talented modders LittleMsSam and icemunmun have already made a solution for your holiday troubles. 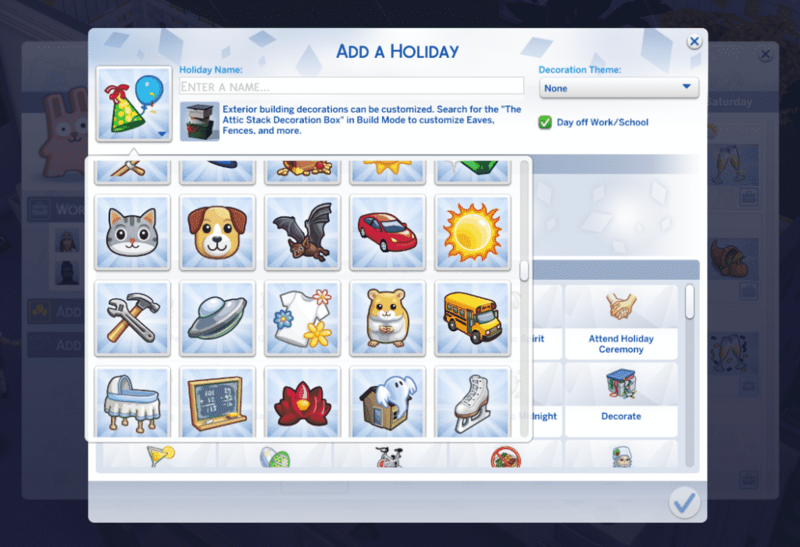 The More Icons Mod by LittleMsSam allows you to choose between 200 icons which are available in the icon chooser when creating or editing an existing holiday. It brings plenty of colorful icons which are already a part of The Sims 4 universe. One thing that everyone was hoping for is holiday integration between the Seasons Expansion Pack and the Cats & Dogs Expansion Pack. Sadly, that didn’t happen and the only tradition from a different pack that we got was “Fireworks” from City Living. Thankfully icemunmun solved that with 9 tradition for your Cats & Dogs! They’re very general and most of them apply to both cats and dogs. To download these mods simply click on the headings of each mod above. Installing them is pretty easy too – simply extract the .zip files to Electronic Arts > The Sims 4 > Mods folder and make sure you have Mods / CC enabled in your game options. These mods have been tested out with the current version of the game and are proved to be working.